This model is strong heavy duty machine with high quality parts such as 6mm thicker 200*150mm square steel's bearing beam, 19pieces holders, Automatic capping system, 20mm wide THK low noise guide rail, variable ink droplet technology, Anti-collision performance, Italy Megadyne Belt and Japanese NSK Bearings, Auto Report Error function, etc. Auto Report Error function: adopts the most advanced electronic boards system. There is automatic error notification function in this system with error code displayed on the printer's screen, with the error code, you can know where to check the problem easily. 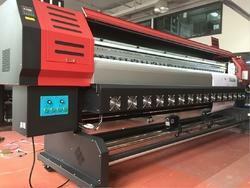 Looking for Flex Printing Machine In India ?